Gujarat State Fertilizers & Chemicals Limited (GSFC) Recruitment 2017 | Trade / Technical Apprentice Posts | Diploma and ITI Pass Apply: Gujarat State Fertilizers & Chemicals Limited (GSFC) has published Recruitment notifications for below mentioned Posts 2017. More information please read below mention details carefully. • Technician Apprentice (Civil Engineering) TACV | Diploma Pass (3 years full-time course) in Civil Engineering. 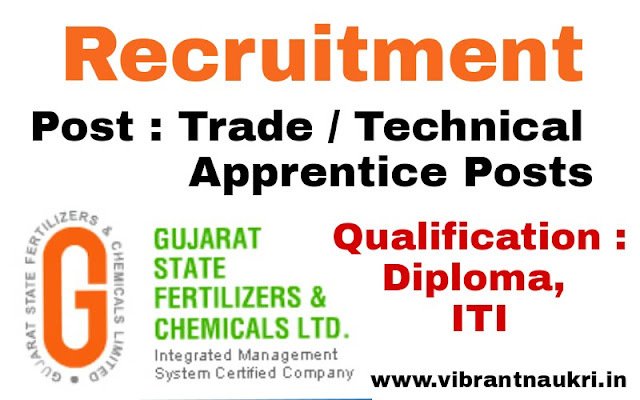 • Technician Apprentice (Chemical Engineering) TACH | Diploma Pass (3 years full-time course) in Chemical Engineering. • Technician Apprentice (Metallurgical Engineering) TAMT | Diploma Pass (3 years full-time course) in Metallurgical Engineering. • Technician Apprentice (Electrical Engineering) TAEL | Diploma Pass (3 years full-time course) in Electrical Engineering. • Technician Apprentice (Mechanical Engineering) TAMH | Diploma Pass (3 years full-time course) in Mechanical Engineering.